Well it was all going to be too easy. Write a blog post in advance, have it sitting ready to go then just approve it using the wifi on my phone in either washington or london airports. Bang, done, cheerio and goodnight. …or so I thought. Last night Washington was hit with 2 feet of snow, thats right, 2 feet. It has ground to a halt, all of the airports were closed for a while and Dulles has only a few flights operating. The flight down here was cancelled so sitting now 4 hours from getting a taxi to the airport I have no idea if I will be leaving or not. There is a thunderstorm here as well so even if I stay there will be nothing else to do, goodbyes were said in the wee small hours this morning etc etc. Now its just a nervous wait to see if I am going anywhere. Despìte some of the blog posts Ive enjoyed my time here. Ive tried to live like a local as much as possible but its impossible when you are a relatively rich foreigner with a spending budget about one fifth of what the locals earn in a year. Its not quite the same when you can just buy yourself out of trouble and Im always keenly aware of that and its effect on the people around me. On any trip I always refer back to my 10 year old self. I grew up in one of the most deprived and the time war torn areas of Western Europe. Back when I was 10 Id flown to England once and hadnt yet applied for my first passport (would do later in the year to go and live with a Swiss family in Geneva for a month). I could only dream of seeing the places I have and the contemporary wisdom would be that I always would dream about seeing what I have done in the last week alone. Like everywhere in the world its the people that make the place, Ive been very lucky here, everyone has been welcoming and people braved the worst storm in a long while here to come an hour or two on the busses and trains just to say goodbye. When that happens you forget about mosquito bites and trips to hospitals and so on. Thats just stuff that happens and no point getting annoyed or dwelling on it. I will hopefully get home sometime and I do feel its time to go home. Looking back the month has gone quite quickly. As usual with trips the first week seems to last a month then after the halfway point it just flies in. Ive been unluckly on this trip, a lot of coincidences and a bit of bad planning or no planning on my part. I came from the coldest winter at home in 30 years to one of the hottest summers here. Just a fluke but the almost 40 degree temperature difference knocked me back for a week, a lot longer than it would usually take to acclimatise. The whole security thing has been an issue and Ive had to be more careful, shelve more plans and just accept the fact I wouldnt be able to do a lot of the stuff I had planned beforehand. With hindsight I would do things differently but again the heat aspect probably would have affected that anyway. Going to the park with the mosquitos was just bad planning on all our parts. I should have checked if going to the park would be 20 mins on the bus or travelling to another country. Then again if I hadnt had such a huge amount of bites and taken the reaction I did, it would only have been a day down rather than almost a week. The trip to Colonia was worth it, firstly to see Colonia, to get more stamps in the passport and to travel round with people I just met and have a glass of water with them. Being Aussies Id love to share a beer with them but the previous nights casualty trip meant that wasnt wise (neither was going in the first place). Overall Im thankful that I didnt get booked into a hotel in Montevideo or Id have got the pain on a 2 hour bus ride between Colonia and Montevideo, something hardly worth contemplating. 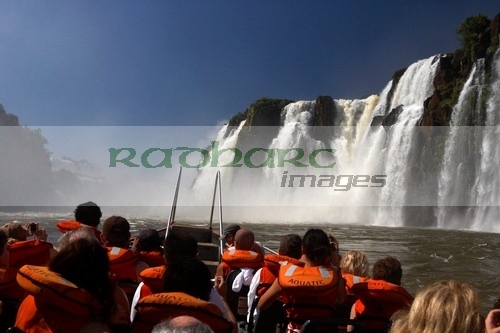 The trip to Iguazu is one of those life moments, a story I´ll bore people with to my dying day. If the photos are half as good as I think they are then it will cost me a small fortune getting canvas prints done. Nothing more to add to that as its already been said in the last blog post.Ive enjoyed my time here, enjoyed the people and the company and learned a few lessons as below. I would come back to Argentina again, no doubt, to explore patagonia and as a stopping off point for Antarctica. Id give Buenos Aires a miss though, theres only so much huge city you can take and a couple of days is more than enough. I wont be travelling to a sub tropical southern hemisphere climate again in January, I can tell you that for nothing. Its 24C here now and Im sitting with long sleeves on. Boy am I in for a shock when I get home. Dont go anywhere thats plagued with mosquitos and is 35C plus at midday. When booking any internal flight in South America, just treat the timetable as a guideline, although saying that with my flight home possibly cancelled, you cant legislate for the weather. If you ever, ever get the slightest chance to go to Iguazu, go. Dont think about it, go. Dont worry about the cost, go. I cant put it better than that. …but heres the story anyway. I used to travel on and off with my three best friends, we went across the globe together, sometimes all 4, sometimes in 2s or 3s. One time we were in Moscow. Ive always wanted to go to Moscow. When I was 12 there was school trip to Moscow and my parents heard about it. They knew I always wanted to go and I knew they couldnt afford to send me. Well they would have found the money but I was one of three kids and not that selfish. So aged 12 I told them I would go myself one day. Aged 27 I went round to their house and told them I was finally off to Moscow with my mates. My dad said that would start my mum crying again as she did when I was aged 12 and said I would get myself there. Ive always been a determined wee bugger. I loved Moscow, despite the shite food, the shite accommodation, the shite tours, the poor service, the unfriendlyness of a lot of the people we met etc etc. I dont think my travel companions shared my enthusiasm. We had spent 4 days or so in Moscow and were preparing to wipe Moscows dust from our feet waiting on the train platform for the train to St Petersburg. As the train arrived one of my closest and dearest friends who has spent more time travelling with me than a human should really have to endure, lifted his rucksack and uttered the immortal words that have come to symbolise returning home after a long or enduring trip. Ive slightly sensored the comments for PG reading but you get the idea.